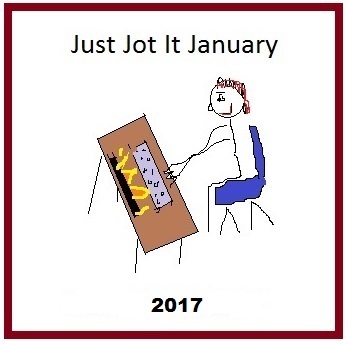 Why, yes, I am using Just Jot It January to catch up on things I have been meaning to do, such as start a new blog series and create a new About page. Facebook helpfully told me today that I joined ten years ago. I initially joined because the Smith College Alumnae Chorus was planning to use it as a primary means of communication among our far-flung membership. It didn’t work out that way, but it did get me to join. I admit that some things about it really annoy me, especially that my newsfeed leaves out so many posts that I would like to see from my friends. I also, of course, am appalled that Facebook was co-opted in the misinformation attack by Russians and others in the lead-up to the 2016 US presidential election. Still, I am sticking with it to stay connected to in-person friends and relatives and a handful of friends that I made through Facebook and feel close to, even though we have never met in person. 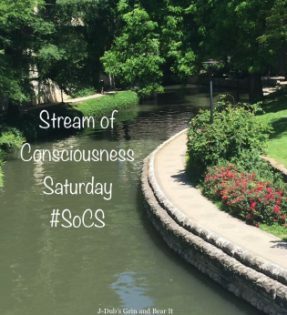 Sleeping has not been much of a thing this week, so this SoCS will be short. Letter makes me think of how I refer to most family members on my blog with a letter. My spouse B, my daughters E and T, my son-in-law L. My granddaughter is extra-special because she gets three letters – ABC! One of these days, I should update my About page to reflect all the changes. I won’t be sharing my most important jot of the day here because it was a private note. I logged in to Facebook in the middle of the day to find that a friend from my college years had sent me a friend request! We had not seen each other in over thirty years, so I was very pleased to be back in contact with him. I immediately accepted the friend request, quickly checked his recent posts on his timeline, and sent him a message – in which I attempted to briefly summarize how my family and I are doing these days. I managed to restrain myself from asking him to like my blog page, but I don’t mind asking all you Jotters! 😉 If you are so inclined, my page is here. Thanks for putting up with my shameless self-promotion! Author Joanne CoreyPosted on January 5, 2017 January 5, 2017 Categories blogging, Just Jot It January, musings, writingTags blog, connection, facebook, friend, JusJoJan, like, note, page, personall, posts4 Comments on New Facebook Friend! I had made the mistake of making a plan for the last week. After getting daughter T on the plane to Hawai’i to visit daughter E, I was going to spend a lot of time writing, both here at Top of JC’s Mind and in continuing work on my poetry collection, in anticipation of needing to take a writing break beginning on the 17th when Nana was scheduled to have a diagnostic heart catheterization, part of the continuing saga of the fainting episode in April. The day after T left, Nana developed shortness of breath and wound up in the hospital with a diagnosis of congestive heart failure. Fortunately, treatment improved her symptoms a lot and she was able to head home within 24 hours. Unfortunately, the episode precipitated a further delay in the heart catheterization, now pushed back to August 31st. Not much writing got done in the last week, but I am tempting fate and re-organizing. I’m pleased to report that I wrote a new poem this morning to fill a hole in the first section of my collection. The poem is about Nana and her father, so it was nice to be able to talk to her this morning and gather some more information that I needed. I have sent her a copy to review and will plan to workshop it with my poetry group when next we meet. Yay! I managed to accomplish something in my plan! And I am writing this post! Crossing my fingers that things will stay calm in the coming days so I can get some more creative time in before my planned break beginning August 31st. Or, if something does come up, I’ll just re-jigger again. My SoCS post did not automatically distribute to my Facebook page, so I am doing this post to check to see if I fixed the problem. In honor of my new email address for Top of JC’s Mind, I have updated my About page. I wish I could say that I was also drafting exciting new posts and poems, but I am coming down with a cold and not trusting myself with anything that takes a lot of brainpower.